The second polish from The Muppets collection by OPI that I want to share with you is Designer De Better. 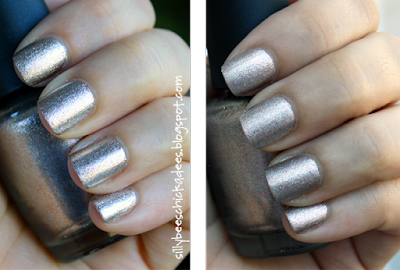 OPI calls it a metallic bronze, but it's more like pewter with tiny pink micro glitter in it. Like Warm & Fozzie, it's a bit thin, so in order to get full coverage you'll need two or three coats. I like that it's not a pure silver foil. In fact it really looks like silver leaf and it's very pretty in sunlight. Again, I used Essie's Matte About You on top to change it up. It's a little difficult to see the difference in the photo but trust me, it's amazing in person. With the matte top coat, Designer De Better has a dull satiny finish. I actually think I prefer it this way! So, there you go! 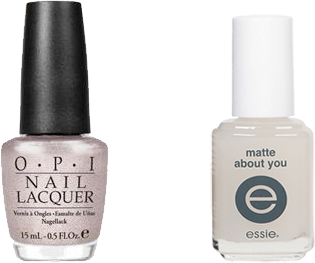 Two easy ways to wear OPI's Designer De Better. Just one more reason I'm Matte About You, Essie.